*On Sundays, when Grand Bazaar is closed, we visit Nuruosmaniye arround Grand Bazaar. 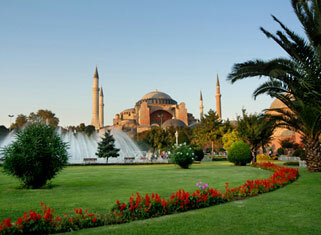 *On Friday morning, The Blue Mosque is closed. HAGIA SOPHIA TOUR This ancient basilica, built by Constantine the Great, in the 4th century and reconstructed by Justinian in the 6th century, is one of the architectural marvels of all time. SULTANAHMET IMPERIAL MOSQUE Across from St. Sophia built in the 17th century by the architect Mehmet, this is known as the SULTANAHMET BLUE MOSQUE because of its magnificent interior decoration of blue Iznik tiles. GRAND BAZAAR TOUR (COVERED MARKET) In this labyrinth of streets and passages are more than 4000 shops with each trade having its own area; the goldsmiths’ street, the carpet sellers, Turkish arts and crafts, such as handpainted ceramic plates, hand-honed copperware, brasware and trays, water ewers, onyxware and meerschaum pipers. We begin our tour of the Sultanahmet district, the heart of old Istanbul, at Hagia Sophia*. Built by the Emperor Justinian in the early 6th century AD and designed by Anthemius of Tralles and Isodore of Miletus, the church is one of the marvels of world architecture. Converted into a mosque in 1453, it is now a museum. Its massive dome still dominates the skyline of old Istanbul. It is also famed for its mosaics, including glittering portraits of emperors and empresses and a poignant Virgin and Child. Next we visit the Blue Mosque which takes its name from the exquisite tiles adorning its interior. Built by Sultan Ahmet I in the early 17th century and designed by a pupil of Sinan, the greatest of Ottoman architects, it is the only imperial mosque with six minarets. Its courtyard is especially grand. The Hippodrome, the stadium of ancient Byzantium, held 100,000 spectators and featured objects from all corners of the empire. Of these, an Egyptian obelisk and a bronze sculpture of three entwined serpents from Delphi survive. The Grand Bazaar was the commercial heart of the old city and its 4,000 shops are full of treasures including carpets and kilims, silks, jewelry, ceramics, icons, and leather goods. Wandering through the Grand Bazaar, indulge in some shopping, Ottoman style. *Afternoon tour also available on Tuesdays.